A take on the more traditional style of wrestling popular in Mexico. 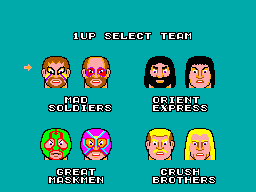 Pick your tag team and battle three other wrestling teams over thirty rounds in three countries. 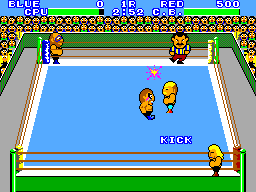 You have four tag teams for you to choose from and the object of the game is to battle each of the other three teams for ten rounds and get the referee to count them out. Aside from a few moves and the obvious cosmetic differences there’s almost nothing to differentiate them. If you can win with one team you can win with them all. If you choose to take the fight out of the ring, make sure you get back in within 20 seconds or you are out. Out of the ring there is a chair you can grab and whack your opponent with or alternatively, once you get them down on the ground you can lift them up and hurl them in to the wall. What really lets this game down is its monotony. As you go through the ten rounds you don’t get any sense of progression. Your opponents don’t even get harder and I have pinned them down on round 9 or 10 faster than in earlier matches and vice-versa. To make matters worse the ring and audience all looks the same when you qualify to the next team even though you are supposed to be in another country (although the referee is different). Even the tag team aspect feels like it is there just to prolong the game since you can knock the living daylights out of an opponent without taking a hit yourself only to have the beggar tag his buddy in and you have to start the beating all over again. The result is an endurance test of a game that makes you feel like you are completing a task rather than playing a game. It’s a brightly coloured game with a colour pallet that looks like it has been borrowed from Matt Groening. The artwork is average at best and there is nothing here that will give you the 8-bit wow-factor. Honestly, I don’t think this would have looked too out on place of the Sega SG-1000/SC-1000. The animation is poor down to non-existent. The walk cycle is limited but when you transition from standing to trying to pin your opponent your character’s sprite just appears on top of him. The music isn’t bad but it’s hardly a Master System classic. The actual game music is catchy but seems to be running away from the gameplay which feels like its lagging behind making the experience feel disjointed. The controls are so-so. It’s not the hardest game to pick up and play but there are problems. The biggest irritation is that you can hit your opponent once and then there is a pause before you are allowed to attack again. This is rage-inducing and kills any sense of speed while making the controller feel like it’s broken. There’s nothing too complicated here with a standard kick and punch attack when your opponent is up. When your opponent is on the ground you can try and get a count out by hitting the kick button to pin him down. 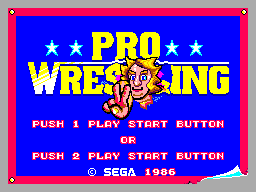 Alternatively, you can pick them up and throw them across the ring by pressing the punch button beside them. When they bounce back you can then inflict pain on them with a high kick. There are a handful of “special moves” such as the Boston Crab or a Karate Chop but it really depends on the team you choose what you get to do. The fact you have to go ten rounds before moving on to the next team makes playing this a laborious affair. For that fact alone it doesn’t sit on the shelf begging you to pick it up and play. Buy it if you are a serious Master System collector and want to tick another one off your list or there is some nostalgic value to it (both is true for me) just don’t pay too much for it. There’s plenty still out there and I got my copy recently (April 2016) for a mere £4 from a retrogaming store and that included case and manual. If you are a casual Master System enthusiast however my advice would be to avoid it.